1. Leopard Shoe 1992 Fluffy fur wet effects. 2. Rouge Dior Lipstick 1953-2013 Metallic effect and masking fluid. 3. Chanel Nail Polish 1924 Graded wash effect with masking fluid. 4. Tiffany Infinity Ring Golden and metallic surfaces. 5. Romantic “Miss Dior” Perfume 1947 Transparency and metallic reflections. 6. Pierre Cardin’s Oversized Red “Delphine” Sunglasses 1960 Red gradient. 7. Louboutin Red-Lacquered Soles 1992 Glossy leather effect with reflections. 8. Iconic Chanel Bag 2,55 1955 Quilted stitching leather effect. 9. Marchesa Evening Gown 2018 Drawing drapes with embellishment. First step, I will work on shape and proportions with a pencil. Second, I will guide you with mixing specific colors, including neutral tones, which are usually quite difficult to mix. The last step, I will show you how to practice with wet watercolor techniques and draw different textures. After this course you will be able to apply your studied watercolor effects to draw surfaces like gold, glass, drapes, embroidery, polished and stitched leather, metallic reflections, transparency and glossy effects. Every class you will find a story about the accessory we draw, as an extra bonus for fashion lovers! This course is perfect for those of you who have little or no experience in drawing with watercolor or fashion illustration. The skills I impart are also very useful for those who already tried watercolor and want to improve their skills with these amazing techniques. If you are going to be a fashion designer, illustrator, artist or stylist this course is for you! If you want to draw for your own blog or Instagram page. Or if you wish to improve your working profile with new skills or just want to draw for pleasure and relaxation. I love to share my passion for watercolors! Can I try one class before buying the whole Course? Yes. You can get a free access to my “Leopard Shoe” class. You get a chance to watch and draw your first watercolor artwork before this course even starts. 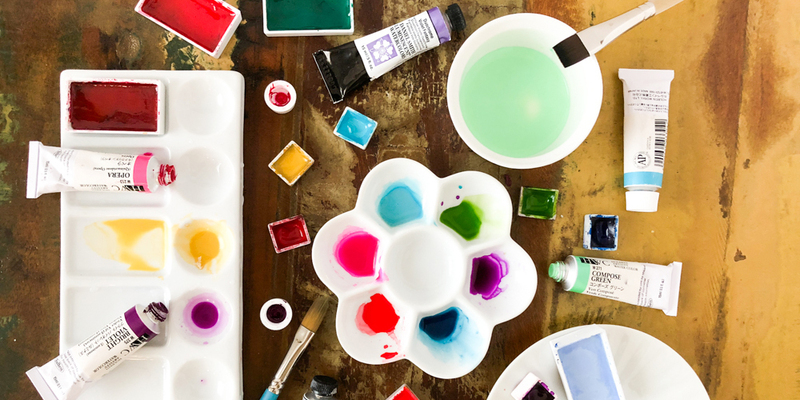 Leave your request using a Google Gmail Account and start your journey with watercoloring! Free access is available upon request. You will get an access to my study platform via your Google Gmail Account. Once per week you will get a new class available on the platform. Each class is prerecorded and divided on smaller parts. Watch the process of drawing an accessory with my detailed instructions in a step by step video. Download reference materials, and practice. Then try and experiment by yourself to refine your art. Once your drawing is completed, uploaded on the platform, and accepted by me, you will get access to the next class. What if I will not complete my artwork? Unfortunately you will not get access to the next class until you upload your drawing on the platform. This class is designed for those who want to improve their watercolor skills. So, once your artwork is accepted you will get access to the next class. How long will it take for me to complete one class? Every class video is 1.5 to 3 hours, plus you will need about the same time to complete your art. In total: 3 – 5 hours per week. For how long will I get access to this Course? Do I need to have any drawing experience? No way! Even if you are a total beginner, I will guide you through all 9 classes with very detailed instructions. To help make your learning process more effective you have an option of Curated Access. What is the Curated Access for the Course? Curated Access is an access I will provide along with my detailed feedback to every artwork you draw during the whole course. Good quality watercolors, watercolor paper A4 and A5 sizes (300g/m, 100% cotton, cold pressed, grain fin), synthetic brushes: rounded N15-20, N10-15 and N00-1, flat N18-20, pencil HB or H, eraser, ceramic or plastic palette, water cup, paper towels, black and white liners 0.3, masking fluid for watercolor. Once you are enrolled in this Course, I will share a video about the art supplies I used when recording this course. How to make a payment for this Course? Once you send a request for this Course you will get details to pay with PayPal. Will there be other Courses? Yes. After you finish the “9 Iconic Accessories” course I will share information about future courses. I have been waiting for this course all my life! I have purchased tons and tons of fashion illustration books, but it’s nothing like watching someone paint and draw and take you through the steps. Irina is so talented and an excellent teacher. I can’t wait to draw and paint all the iconic accessories and the apply what I have learned to my own projects. Thank you for offering this course, Irina! What to expect? Easy going tutorial, time flexibility to watch and draw, an expert guiding you step by step. Imagine how easy is to improve your skills and enjoy the expression of colour at the same time. Be better in any part of the world you are, you will grow as an artist and make even more beautiful illustrations, Irina is the best who can teaches you techniques, mixing tips, and all you need to know, to make an amazing, flawless and beautiful illustration, she has done it easy for you. You can take your time and repeat the instructions as needed to conquer more abilities. Right now you have a big gift!, a leopard shoe class with free access, all you need to know to draw a beautiful leopard heels, as i have done it, for beginners and advanced, and I’m so grateful with her for this opportunity wich had made be better in the art of painting. During the learning process, the success is also in to have excellent teachers, here’s Irina Kay and the way she beautifully teaches you. With lots of love and gratitude, Lupita Machain from Mexico city. Best online course ever!! Irina is a fabulous teacher and provides very detailed instructions. I love the option to have her input on my work as well. Highly recommend this!